The purchase finally went through on Opening Day 1989, Bill Tucker recalled years later to The New York Times. He and friend Jerry Walker had just purchased a baseball team, the Bellingham Mariners. They held a press conference and everything. They also had to quickly learn the ropes, according to The Times. "Not only did we get the team, we got a batting cage," Tucker explained to The Times. "And we got a bus. The bus was very important. Plus we got a box of Ken Griffey rookie cards because he played with the team." Tucker and Walker went on to make the franchise a success, jointly owning it for more than 25 years through its move from Bellingham to Salem-Keizer, Ore., in 1997. While Walker owned it locally as a native of the Northwest, Tucker owned it from across the country as an attorney in Brooklyn. 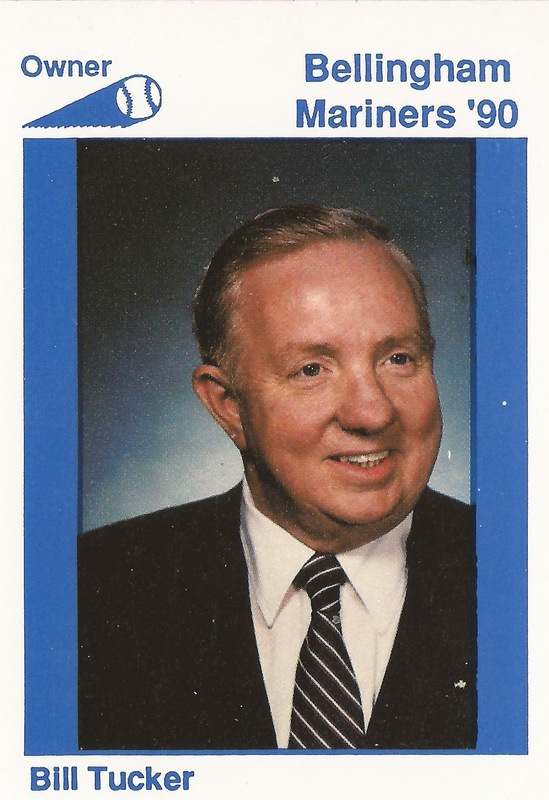 "Bill has seen his baseball fantasy come true with his involvement with the Bellingham Mariners," his 1990 card back reads. "A life-long baseball fan, he brings to Bellingham plenty of enthusiasm and energy." The franchise stayed in Bellingham through 1996 before moving to Salem-Keizer, becoming the Volcanoes. Along the way, Tucker served as vice president of the Northwest League and as part owner of another team, the Norwich Navigators in Connecticut. As for how a New York lawyer got to purchase a baseball team in the Pacific Northwest, Tucker wrote a book about that with Walker, published in 1998. "The two met at the Mickey Mantle/Whitey Ford Fantasy Baseball Camp in Ft. Lauderdale, Florida and the story grew from there," the book synopsis reads. Tucker continued his involvement with the team until 2015, when Walker and wife Lisa purchased Tucker's part. "Lisa and I are honored that this ownership partnership of 27 years helped contribute to three World Series Championships and six Northwest League pennants," Walker said in a statement after the purchase. "It is one of the great recent runs in Pacific Northwest Minor League baseball and we thank Bill Tucker and his family for their true passion for the game."